"This beautiful marinade adds an exquisite flavor to these already tender steaks. The final result will be so tender and juicy, it will melt in your mouth." In a medium bowl, mix the vinegar, soy sauce, garlic, honey, olive oil, ground black pepper, Worcestershire sauce, onion powder, salt, liquid smoke, and cayenne pepper. Place steaks in a shallow glass dish with the marinade, and turn to coat. For optimum flavor, rub the liquid into the meat. Cover, and marinate in the refrigerator for 1 to 2 days. Preheat grill for medium-high to high heat. Lightly oil the grill grate. Grill steaks 7 minutes per side, or to desired doneness. Discard leftover marinade. 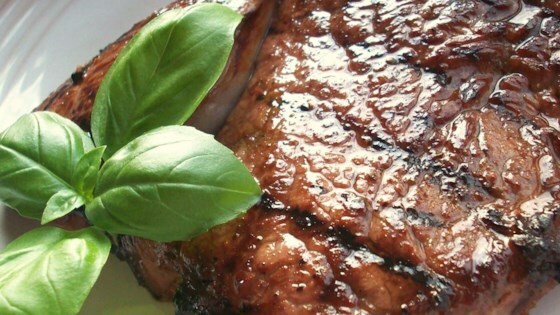 See how to make a simple marinade for tender, flavorful grilled steaks. Aluminum foil can be used to keep food moist, cook it evenly, and make clean-up easier. Nutrition data for this recipe includes the full amount of marinade ingredients. The actual amount of marinade consumed will vary. So good. I marinated a 2 lb. top sirloin steak overnight. Nice crust and very flavorful. BBQed for about 25 min. for med-well.